As fans are anxiously waiting for the official launch of Redmi Note 7 Pro, the CEO of the Redmi brand, Lu Weibing, has conducted a poll on Weibo to know what upgrades the fans would like to see on the upcoming Redmi Note 7 Pro Android Phone. 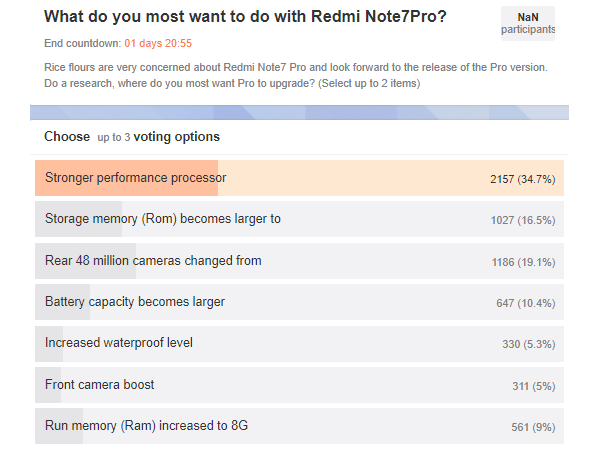 The ongoing poll result so far shows a larger percentage of fans would love to see a stronger processor performance on the upcoming Redmi Note 7 Pro Android phone. According to the screenshot above, 35% of the fans would love the Redmi Note 7 Pro to come with a stronger and faster Chipset. The result so far also revealed that 19% have voted for the 48 Megapixels camera to be improved, while 16% thumbed up for the internal storage capacity to be upgraded. Other options included in the poll as seen in screenshot received lesser votes. Meanwhile, Redmi Note 7 Pro is rumored to come with an upgraded Sony IMX586 48-Megapixels rear camera with a Snapdragon 675 chipset. Rumors also have it that the Redmi Note 7 Pro will be coming with 6GB of RAM, tagged along with 64GB internal and 6GB of RAM with 128GB internal storage models. The Redmi Note 7 Pro will be sold at a much higher price tag than Redmi Note 7. The base price is rumored to be CNY 1,600 ($240) for the 6/64GB version.